I know I’ve mentioned this before, but I absolutely adore Arthur Kennedy. This is going to sound a little weird, but out of all the classic movie actors I love, he is the one I spend the most time obsessing over (watching his films, reading about, collecting memorabilia, etc.) Not only do I think he’s a wonderful actor, but he’s one of the most handsomest, attractive actors that I’ve ever seen. It was after seeing his performance as Jim Lefferts in Elmer Gantry (1960) that I became interested in his work and from then on, I started taping and watching every movie of his I could get my hands on. I figured it would be just a phase–after all, I went through my Joseph Cotten, Martin Balsam, and Alan Arkin phases and came out fairly unscathed. That was two years ago and Arthur Kennedy still holds a high place in my heart, only slightly challenged by my relatively newfound love for Robert Ryan. One day, I’ll bore everyone with nice, long entries about both of them in “Classic Movie Actors I Obsess Over” posts. 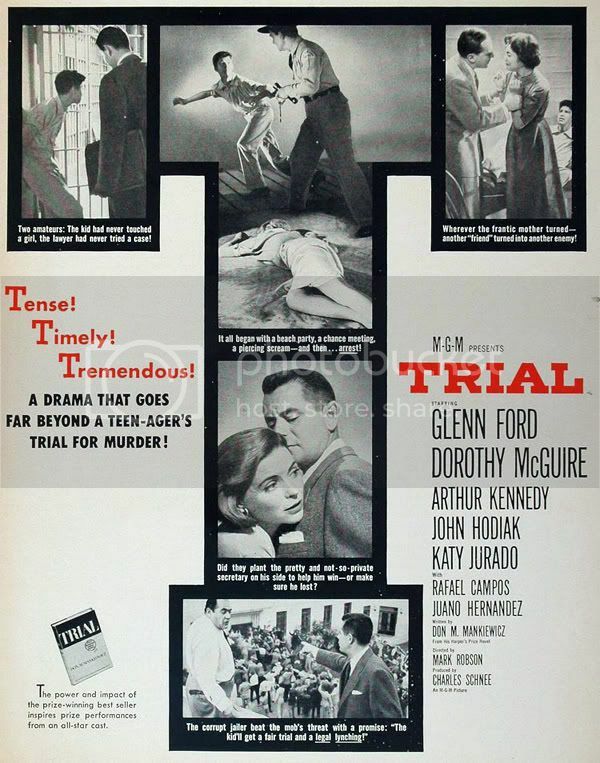 But instead of that, I’d like to recommend for you the 1955 courtroom drama, Trial, which airs February 29 at 8 am on TCM. Set those VCR’s or DVD/DVR Recorders! Although it boasts an impressive cast that’s headed by Glenn Ford and Dorothy McGuire, it remains a relatively obscure film today. Directed by Mark Robson, Trial is the story of a young Mexican boy named Angel Chavez (Rafael Campos), who gets caught up in the murder of a caucasian girl. Racial tensions already run high through the town and the accusation against Chavez only adds fuel to the fire. Enter David Blake (Glenn Ford), a law professor who finds out that he needs more courtroom experience in order to keep his job at the University. Blake goes from lawyer to lawyer and is rejected by all–except for Barney Castle (Kennedy), who is also handling the controversial Chavez case. Working for Castle is his attractive assistant, Abbe Nyle (Dorothy McGuire), who has a somewhat shady past of her own. As Chavez’s case gains momentum and his trial begins, Castle heads off to New York City with Mrs. Chavez (Katy Jurado) to raise money for his defense fund. Soon after, Blake joins them, only to find out that Castle is using Angel as a cover to raise funds for the Communist Party. I’m not going to spoil the rest of the story for you though–you’ll have to watch it yourself. Trial is directed by Mark Robson, a director who has been forgotten over time except by die hard classic movie fans. But one look at his filmography and you’ll see that he directed many important classics: Peyton Place, The Bridges at Toko-Ri, The Inn of the Sixth Happiness and The Harder They Fall as well as the late-60’s cult classic, Valley of the Dolls. Despite it’s obscure status, Trial is probably one of his best works. Before filming, Robson insisted his actors attend rehearsals and I’ve noticed that it always pays off in the end, especially in an ensemble movie like Trial. Everyone works off one another seamlessly and the dialogue is sharp. It’s as though you’ve stepped into a real-life situation, not a Hollywood movie. 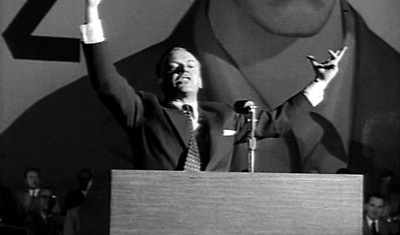 And of course there’s Arthur Kennedy. As the slick, manipulative Barney Castle, there’s no doubt that he has the best role in the movie. There are so many facets to his character. At first, he comes across as the overbearing lawyer who seems to have Chavez’s best interests at heart. But by the time Blake arrives in New York City, Castle’s cover is blown: he’s really a card-carrying Communist who only cares about raising money for the “All People’s Party.” When Blake finds out, he’s livid. He argues that the majority of the All People’s Party are Communists, to which Castle flippantly replies that it’s actually “about 60% and some of them are cheating the party out of it’s dues.” Blake tells him he wants none of the Party’s money for Chavez’s defense fund and without missing a beat, Castle sneers, “You want nice honorable American money, not dirty Commie money.” He’s heartless. It suddenly becomes clear: Angel Chavez has ceased to be a human being. He’s strictly a commodity. Castle has dollar signs for eyes and he’s completely soulless. Kennedy plays the character to the hilt, making him equal parts despicable and smarmy. 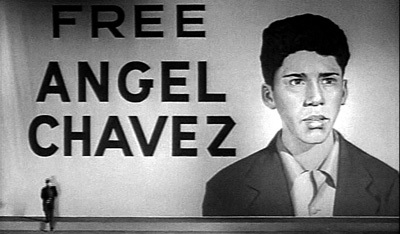 However, it’s Kennedy’s performance at the “Free Angel Chavez” rally that shows the true test of his acting skills. With banners boasting messages like “Peace” and “Freedom”, Castle works the assembled crowd of thousands before him like an old pro, winning them over with his charm and charisma, but not before launching into what he calls (in private, of course) “The Sea of Green bit.” He asks the entire audience to hold up one dollar bills, and then tells them to close their eyes, promising the money will still be there when they open them back up. He’s lying of course. A man like Barney Castle has never told a truth in his life. And when the disgruntled crowd finds out that they’ve been had, Castle just laughingly tells them, “Don’t trust anybody!” and they eat it up. It’s amazing to watch Kennedy work the volunteers that quickly move around to collect the money. He hustles them, quickly moving back and forth from each side of the stage, while clapping his hands to encourage them. It’s an amazing performance to watch–one that simultaneously impresses and angers you. Taking on a such a role in the 50’s was fairly dangerous: thanks to McCarthyism, Communist paranoia was still rampant. The liberal Kennedy once donated money to the New York Post, supporting editorials that lambasted McCarthy for all the damage he was doing. After seeing his name attached to one of these anti-McCarthy advertisements, a man contacted Kennedy thinking he was giving money to the Communist Party. Luckily, Kennedy’s cousin was a leading man in the New England chapter of the FBI and this cleared him. Or was it the fact that he was Irish and served in WWII’s Motion Picture Unit? It seems that other liberal Irish actors who served in the war (Gene Kelly and Robert Ryan first come to mind) also escaped the era unscathed based on the fact that they were Irish and Catholic, therefor no Irish Catholics could ever be Communists. The mindset of that era boggles my mind sometimes. Robson was what Kennedy called “his lucky rabbit’s foot”. This would be his third Robson-directed performance to be nominated for an Oscar, the other ones being Champion (1949) and as a lead actor, Bright Victory (1951). 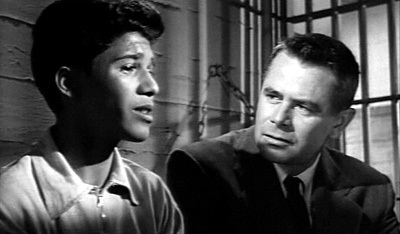 Kennedy would lose the Oscar to Jack Lemmon for Mister Roberts, and would be nominated for one more Robson directed picture, Peyton Place (1957). 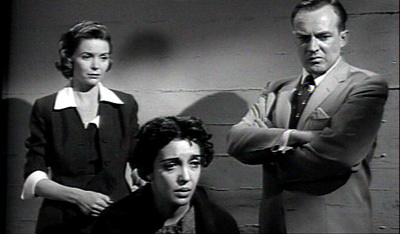 His final supporting actor nomination came for his turn as a philandering husband in Vincent Minnelli’s Some Came Running (1958). However, Kennedy did win the Best Supporting Actor Golden Globe for Trial, so it was nice to see that the Hollywood Foreign Press recognized his outstanding work as Barney Castle. I’m not sure if any other actor could pull such a smarmy characterization off like Kennedy did. There was something so real about him. It wasn’t just in the delivery of his lines, but the expression on his face, the movement of his body–not to mention his arrogant nature. By the end of the film, Castle turns out to be such a horrible person, you’re practically hissing at the screen. Of course this review might be somewhat biased since I’m such a huge fan of Arthur Kennedy. I could rattle off at least 10 other films where I think he put in outstanding work, but I won’t. I’ll save those for other posts. But if you’re into well-written and acted courtroom dramas from the 50’s or want to see one of Hollywood’s most popular supporting actors doing some of his best work, I wholeheartedly suggest you give Trial a chance. And if you don’t like it, you can come here and tell me that I have lousy taste in movies. Information about Kennedy taken from Arthur Kennedy, Man of Characters by Meredith C. Macksoud, with Craig R. Smith and Jackie Lohrke. One of my all time favorite biographies!